If you've ever wanted to become the human equivalent of a burrito, well, you're in luck, my friends. 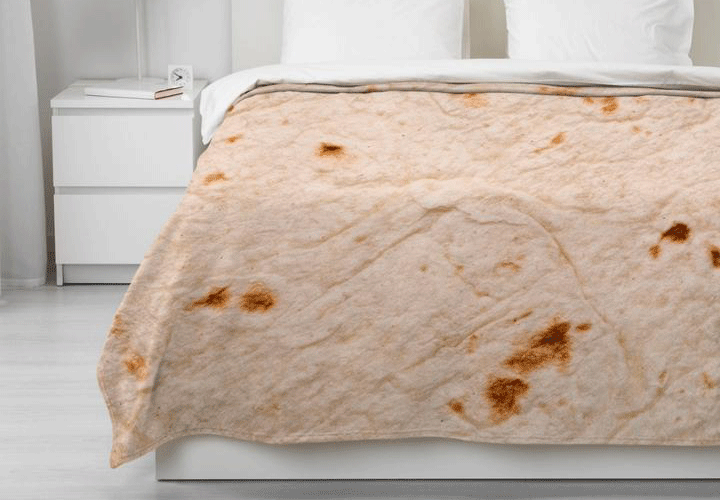 This burrito blanket is guaranteed to take your food coma naps to the next level! Since then, many folks have searched far and wide, trying to figure out just where she found this incredible feat of human craftsmanship and innovation -- versions of the blanket have sold out on Amazon -- and then @katreenawhh graced us with the site she bought it from so we can get our very own, Free By Love. Free By Love is currently selling a small burrito blanket for $39.95, with larger sizes available if you're looking to get nice and cozy with some buddies. I mean, think of allll the uses this blanket possesses. Having a girls' night in? Make it a burrito night instead! Want to eat a burrito while sitting snug in your burrito blanket? Have at it! (*Insert you-are-what-you-eat joke here. *) Seriously, the possibilities are endless. So, who else is ready to turn themselves into a giant burrito? ?